I just returned from an adventure in Mexico, but I didn’t have my fill of fish. On my last evening we went to a fancy restaurant called El Dorado, and I got their titular dish. It was a piece of fish with plantains. 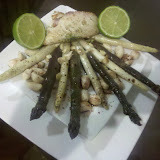 It was delicious, and I have been day dreaming about making some delicious fish myself. So, I went to the Fresh Market and got myself some tilapia and scallops for my fish, some white and purple asparagus and garlic for my side. I threw the tilapia and scallops in a bag with dill and sous vided them for a few hours. 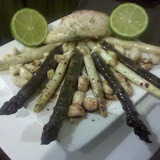 I then roasted the asparagus with pepper and the garlic. I fried the tilapia and scallops for a second or two to brown them. I put the scallops in between the alternatingly funny colored asparagus, piled the tilapia that I tore up (by accident) on the bottom and put the one intact piece on top. 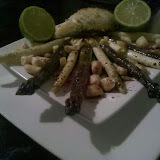 I tried drizzling balsamic vinegar on the asparagus, but it was cheap vinegar so it wasn’t thick enough. I don’t think I’m at the Top Chef level, but it looked pretty good. It tasted pretty great. 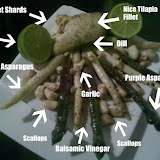 Roasting asparagus makes it nice and crunchy. The scallops were the least impressive, I should have browned them more or something… or maybe sous vide isn’t right for them? They ended up bland. The fish itself was good. I added some dill, but not enough. I have two more tilapia fillets preseasoned in sous vide bags in the freezer, hopefully the next adventures will be even better. So, to keep his mind busy, Alan decided to count stairs. Once again, not particularly unique for him… most days to work he counted the number of strides from the parking lot to his office. (143 if he followed the crosswalks and sidewalks, 131 if he cut through the gravel). But, Alan’s body wasn’t used to traversing so many stairs. After three days, around 10 round trips, he still was unable to count correctly. He knew the answer, since there were 8 steps per flight, 2 flights per floor, plus a magic extra stair on the first floor. Often, around floor six or seven, he would notice his stair count didn’t add up to an odd number, and he would know he was screwed… but fixing the number would be cheating, and stopping counting would be giving up. I am a video game programmer. I live in Upstate New York. I like to program, cook, and watch movies. Entries (RSS) and Comments (RSS).13 queries. 0.090 seconds.